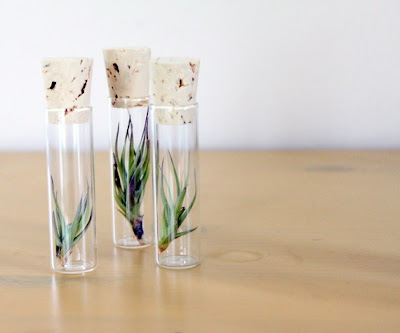 east side bride: Are you sick to death of air plants?? 75+ tall corked air plant terrariums are $343 from TortoiseLovesDonkey. love, but that comes out to more than $4.50 apiece; i feel like some masterful wholesale action could get that done more cheaply, no? I feel like most wedding guests won't know what these are and would probably toss them. Pretty, but they'd likely go to waste. my uncle totally ate one of the seed-bomb-dirt-pops at my sister's wedding in october. i won't lie, it was awesome. lauren, your uncle just made my day...great story! I'm still not sure what the point of a wedding favor is anyhow. Isn't a catered party and being invited to witness one of your life's milestone moments enough? But yes, I like the air plants. Love them to pieces, but probably would just use them to pretty up my house and tell all my friends of their greatness. Ms. Bunny is probably on the right track. I dunno I think they are really beautiful. If I got one at a wedding I would def display it. I think where these would be worth the money is it you put them out at every seat and didn't hide them on a "favor table" in the corner. Then they would double as table decor and a favor.